Instructions for canceling a subscription to the deluxe plan. If you would like to cancel your website subscription to the deluxe plan and be downgraded to the free plan, you will need to follow the steps listed below. First, visit the "Billing" section in the Admin Control Panel. In here, go to the "Plan info" tab and then click on the red "Cancel subscription" button. 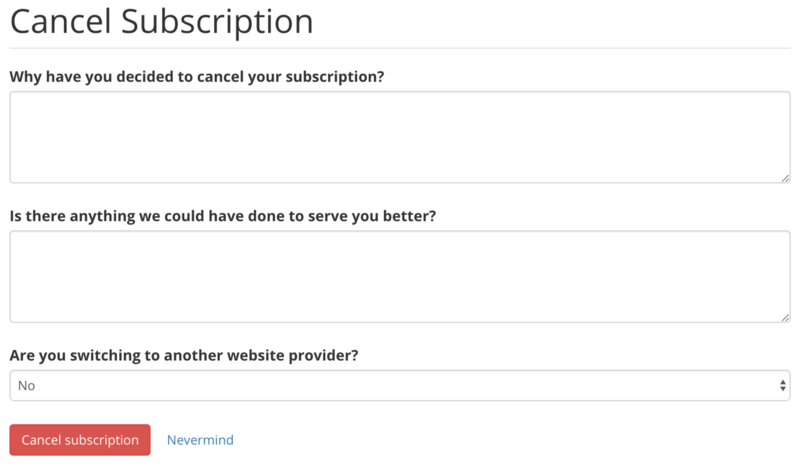 Then, fill out the prompts on the next page and click on the red "Cancel subscription" button. Once you've canceled your subscription, and after any remaining time your community has paid for on the deluxe plan runs out, your community's website will be downgraded to the free plan. You will always be able to re-subscribe to the deluxe plan at any time by clicking on the "Upgrade to deluxe plan" button in the Admin Control Panel.